Meetings are one of the most expensive things your company does. Not only do they burn TIME, and a lot of it, bad meetings also burn energy and momentum. If you’re consistently seeing a lot of the behaviors below, you’re probably better off cancelling your meeting and sending your people back to work than you are having it. Meetings usually start a little or a lot later than scheduled. The meeting takes too long and moves too slow so people start working WHILE the meeting goes on...which slows things down even further and wastes more time. You spend a lot of time trying to remember or figure out what people were supposed to do. Results are inconsistent. Accountability is spotty at best. Sometimes people do the work, sometimes they don’t. Sometimes it gets addressed. Mostly it doesn’t. You’re frequently delayed by technology problems. The speaker for the conference line doesn’t work. The projector needs to be set up. Someone forgot their power cord. You spend a LOT of time talking but it’s hard to get to an actual decision. People “agree” to things they aren’t really aligned with and won’t really do. There are lots of side conversations or talking over/around the person leading, which slows down the process, which leads to more side conversations and so on. Each meeting spawns lots of mini-meetings like wet Gremlins. People reconvene to rehash what happened, repeat their complaints, restate their case for what THEY wanted and just gossip. If you want to fix your meeting instead of just cancelling it, you have options. You can spend a lot of time in communication training, or writing better agendas. You can have “Stand Up” meetings or use timers or even electroshock. But the real problem with your meetings are simpler, and more practical. And so are the best solutions. A lot of meetings get very long because people are using them to try and figure out what is going on. It’s 3 or 5 or 7 people giving all kind of updates about all kinds of things. There’s no format, little preparation, and no way to keep track of what is shared, assigned or promised from meeting to meeting. The problem, in this case, isn’t the meeting. The problem is that you’re missing good systems and processes for gathering data. NO ONE wants a lot of paperwork to fill out or long reports to read. But a LOT of the information your team needs is the same from month to month. It can be gathered quickly and displayed visually so everyone can quickly get on the same page about what is happening and turn their focus to what to DO about what is happening. In more formal organizations people tend to be more disciplined about how they report and share data. When there's no format and no preparation you'll find people saying way more than they need to and leaving out important details. You leave yourself open to long tangents, confusion and rambling stories. Be specific about what people should share and how long they have to do it. Human beings are VERY sensitive to subtle cues in their environment. Ever walk into a room and KNOW two people had been fighting even though they’re smiling now? Ever have a substitute teacher in junior high? You could tell within a few minutes how strict or laid back they would be and therefore how much you could get away with. 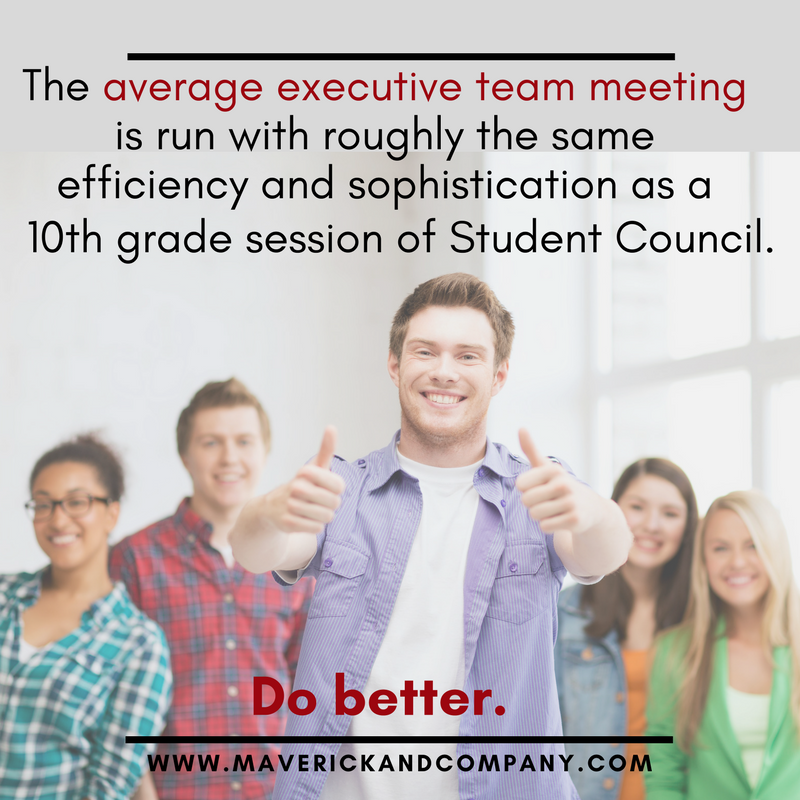 Meetings work the same way. If everyone is rushing in, and a couple people are always late and the boss is standing in the hallway on his/her phone, you’re not exactly inviting people to bring their A-game. Late and sloppy sets a tone. So does on time and sharp. Reset time with your team. Acknowledge that things have gotten a little off track. Ask people to tighten things back up. Get their agreement. Draw the line. Lead the way and hold the standard. Good meetings mean you have better information, better coordination, make better decisions and produce better results. Putting a little more discipline into them will help you get a lot more out of them.